The Crux: The KTM RC390 has established itself as the benchmark for entry-level sportsbikes thanks to its blistering performance and affordable price tag. The R3 is Yamaha’s answer to the competition offering the best balance of ride and handling. We pit the two together to see what both these bikes are all about. Now this segment may be the entry-level sportsbike segment, but when it comes to the styling the buyers will not accept anything less than top-notch styling with the bike looking like a proper sportsbike being a mandate. So what does a proper sportsbike look like you might ask? For starters it’s got to have a full fairing, clip on handlebars and most importantly a meaty rear tyre to complete the sportsbike look. And both these bikes here have all that and more. Starting with the new kid on the block, the YZF-R3, Yamaha has got the styling spot on. What you won’t notice in the pictures is the proportions. The R3 will be pushing the limits had there been restrictions on size on small capacity sportsbikes. It really is that big. In comparison, the RC390 is the exact opposite. While it looks big in the pictures, it’s actually quite compact in the metal and in fact looks a segment smaller than the R3. The Yamaha boasts a very proportionate design as well. Right from the sharply designed split headlamps, the beautifully crafted fairing all the way down to that r6-ish designed taillight, the R3 is a looker all the way. In comparison, the RC390 is a love it-hate it design. The bike boasts some awesome details like that lovely orange exposed chassis, the wedgy tank and that brilliantly designed rear seat. But as a whole, the design can be termed as a little too radical by some. The instrument console on both the bikes offer an exhaustive amount of information like 2 tripmeters, gear indicator, shift light, clock and the works. However, information is easier to grasp on the R3 thanks simply because everything is so well spaced out as compared to the RC’s cluttered instrument console. Quality of materials is good on both the bikes with most things well finished but the R3 definitely feels better between the two. I can say this because the RC starts rattling and buzzing almost right out of the box whereas the R3 even after this one being a test bike was still holding up very well. Getting on the RC’s saddle, you immediately recall KTM’s tagline, ‘Ready to Race’. The RC’s seating is as committed as it can get thanks to the low set clip-ons and the high-ish saddle height. If you’re thinking of going fast all the time, this is just the right riding position, however for the times when you’re not, you will curse the RC. The seat is actually a plank of wood disguised as a seat and the aggressive riding position means plenty of weight on your wrist, which after long hours of riding will start getting to you. This is where the R3 shines. Immediately after the RC, the R3’s riding position feels like getting on an upright motorcycle. And I’m not kidding the RC really is that committed. The seat is perfect with the right amount of cushioning and the foot-pegs aren’t too rear-set either giving it a comfortable riding position which even after hours of riding is not half as bad as riding the RC. Overall, I’d call it a split decision when it comes to design, but give it to the R3 when it comes to ergonomics and build quality. Let’s begin with the Yamaha here. This is a brand new mill we’re talking about and the in-line 2-cylinder engine comes with the works like DOHC, 4-valve fuel injection, forged pistons and Diasil cylinders and then some. What that translates into is 42PS @10,750 rpm and 29.6Nm @ 9000 rpm. When pitted against the RC390, the KTM has a cylinder less but still puts out 43.5PS @9000 rpm and meaty 35Nm of torque @ 7000 rpm. And it’s just as state of the art as the Yamaha with 4-Valves, forged piston, fuel injection and more. Start the engines and both come to life as differently as chalk and cheese. 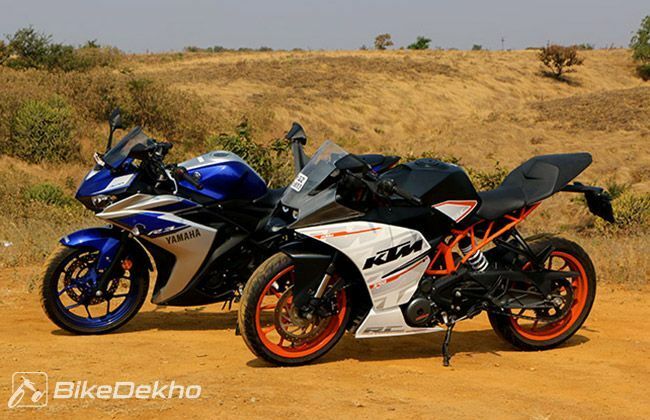 The KTM idles with a raw-ish TRRR, while the R3 just hums itself to life. Clutch feel on both the bikes are good and the so is the shift action. Both the bikes sport a 6-speed gearbox but somehow the shift action on the Yamaha felt a little more precise. Off the mark, the KTM simply lunges forward and if you get the launch right will hit 100 km/h in a scant 5.8 seconds while the R3 follows taking 6.6 seconds for the same. The KTM hit the limiter the moment you manage to hit 178 km/h while the R3 managed to cross 180 on the speedo. So the KTM does win the numbers game but then the R3 isn’t too far behind. What is very different is the way these two put the power down. The KTM is pretty much like a frisky animal waiting to be unleashed. It lunges violently and has some pretty serious engine braking as well, which can shake you front and back quite abruptly in case you don’t upshift. It just hates to be ridden calmly, but the moment you start hooning it around it reveals its true identity. There is plenty of power on tap and you either have the front wheels talking with the air or the rear tyres struggling for traction. And this nature can make it quite a handful for amateur riders. The R3 on the other hand can be ridden how you want it. Rather it can change its character depending on the rider’s mood. No that does not mean that it’s happy in chaotic traffic but its still way less temperamental the KTM. The power deliver is extremely liner and reminds you immediately of the Ninja 300. Only here you have more power at hand and the R3 can manage to get into serious speeds with the rider noticing only if he glances at the speedo. The engine is extremely refined and its only a slight tingle from certain areas that let you know that you are maxing the bike out, unlike the KTM which manages to send out a lot more vibes. Both the bikes come with discs on either ends and stop just as well as they accelerate, but the KTM thankfully has ABS, which makes emergency, stops a lot more safer. The R3’s bite feels much more progressive but sadly it lack ABS which I think should have been offered at least as an option. In the end, if you crave brutal performance and need the fastest bike in its class, the KTM is king. But if you prefer refinement and better everyday usability then the R3 is the easier bike to live with. Its only when you ride both these bikes back to back that you realize how different they really are. The KTM gets the same steel trellis frame also in the Duke but slightly modified which gives the RC a shorter trail, shorter wheelbase and increased ground clearance of 178.5 mm which makes it extremely flickable. With a kerb weight of 166 kg the RC is lighter and gets WP upside down forks as well. The R3 relies on a more conventional steel diamond frame chassis instead of the famed Deltabox, which the R15 gets. But Yamaha has skipped on upside down forks and gone with the usual telescopic suspension. At 169 kg it is slightly beefier than the RC as well. Hitting the twisty’s, the KTM really comes into its own especially in tight corners. It feels extremely agile and the stiffer suspension setup along with those fantastic Metzeler tyres means you can really stitch corners like no other. Yes the rear does tend to get a little too soft at times but then dialing in some preload makes it feel way better. There’s ample grip, plenty of lean and the dynamics just make you feel very confident. But then once the corners are over and you’re welcomed by the famed Indian roads with the lovely khaddas and uneven surfaces, the KTM starts bouncing around like a pogo stick. There is simply not enough damping to absorb the irregularities. And that does get tiring on a long ride. The R3 may not have got upside down forks but its regular suspension works wonders here. On daily commuted and bad roads the R3 does a brilliant job of absorbing the bumps and feels extremely comfortable. You can ride it around all day in most conditions and the R3 will trundle around happily. The only moment when the R3 won’t be too happy is when you try chasing down an RC390 on the ghats. For starters the R3 feels a little heavy when you try to change directions a little too quickly and then there are the tyres. The MRF’s the R3 comes shod with aren’t too bad on their own but in the exalted company of Metzeler’s they start feeling a little lacking especially when you start pushing the bike harder. It might not be as flickable as the RC but the R3 feels right at home on long sweeping corners with the longer wheelbase making it feel extremely planted. Mid corner bumps are also better absorbed by the R3 compared to the RC, which can get upset very easily. If you like to do track riding or simply revel riding your bike in corners and don’t really care two hoots about long distance riding or comfort the RC390 will make sure you smile ear to ear every time you gun that throttle, but if you want to do a little bit of everything and still not complain about body ache, the R3 is your bike. No matter how different, in the end it all boils down to which is better. The Yamaha R3 is the last entrant in this segment and other than that, the KTM competes with the Kawasaki Ninja 300, which is now a little long in the tooth, is outperformed in this company and not to mention is the most expensive as well. Yamaha has made sure that the R3 looks brilliant which is half the job done and goes just as well. It’s got a comfy riding position and friendly riding manners as well and will do well with people upgrading from smaller capacity bikes. Priced at Rs. 3.26 lakh ex-Delhi it’s cheaper than the Ninja as well. It all looks good till the KTM comes into the picture. Armed with ABS, much better tyres, projector headlamps, more power and all this at Rs. 2.14 lakh Ex-Delhi, the RC390 is over a lakh cheaper making it feel like a bargain of the century. Yes it’s not as comfortable or as refined as the R3 but with a price tag like that these niggles suddenly seem livable with. As good as the Yamaha is, the RC390 sweeps up victory with more equipment, more performance and a way cheaper price tag. Make in India has never worked this well before!